For the majority of my twenties I was the single girl in a group of mainly married friends. Thursday nights we’d all squeeze onto an over-sized sofa to watch The Office and most weekends we would meet up at the beach on Saturday afternoons. In between passing bags of Kettle chips back and forth, the girls and I flipped through magazines and chatted, while the boys invented games using seaweed and driftwood as markers in the sand. I never felt left out or “less like an adult” because I didn’t come with a significant other. That is until it was time to leave. I watched as they hopped into their cars, two-by-two, and drove away together. I sat in my white Honda with the sunroof down and felt the twinge of sadness that sets in when you realize, I’m going home alone. Somehow I had imagined my married friends driving home together having incredible conversations; discussing everything that had just happened and responding with active listening skills. Upon arriving at their driveway, I pictured them walking through the door hand-in-hand, having magical moments as they talked in the kitchen and then cuddling up on the sofa, before crawling into bed together. Now, four years later and 8 months into marriage I can confidently say that I had some unrealistic expectations about marriage. The truth about marriage is most days are very, very ordinary. Someone has to take out the trash. Someone has to put gas in the car. Someone has to make the bed. And in our home, it’s whoever is the last person to get-up (which is usually me). There are towels to fold and emails that are waiting for replies. Some days someone is tired, or someone else is stressed and the conversation doesn’t get beyond who is going to the bank? did you call the doctor? And who is going to the airport to pick up the next group? As I write this now, we’re both on our computers. He’s at the table, I’m on the bed. There is no magical moment happening in the kitchen. Unless you count the stack of dishes that are patiently waiting in the sink. Of course this is not the whole picture of marriage, but it’s definitely part of it. And I think it’s important to tell this part, less any single person is watching their married friends drive away together and still thinking that they are going off to the magical land of holy matrimony. Marriage is made up of a million, mundane daily tasks. And I have found the beauty in marriage is getting to do these ordinary tasks with someone. Or for someone. Of course there are still meaningful, long conversations, and spontaneous moments of pure fun and hand-holding while walking through the park, but I have found real intimacy through learning how to do daily life together. And I think this may be be one of marriage’s intended gifts. More than love and magical romantic moments, most of us long for intimacy with a spouse or partner. I believe this is the kind of marriage you create when you embrace the ordinary, and make time and space for intimacy to grow. If you’re married what does your “ordinary” look like? If you’re single have you ever watched married friends drive away together and thought something similar? Why is it so easy to do that? In a culture that feeds us stories of either fairy tell weddings or of marriages that crumble into messy divorces, I think its important to have places where you can tell the truth. What does real, not perfect, day-to-day marriage look like? What does loving someone with everything you got look like when a minute later you’re so frustrated wondering how on earth this is going to work? Maybe when we learn to be honest about what marriage looks like (the good, the ugly and the confusing) we’ll be less and less inclined to worship the idea of it. Marriage is wonderful, but it is certainly not a means to end. I want to tell the real story. 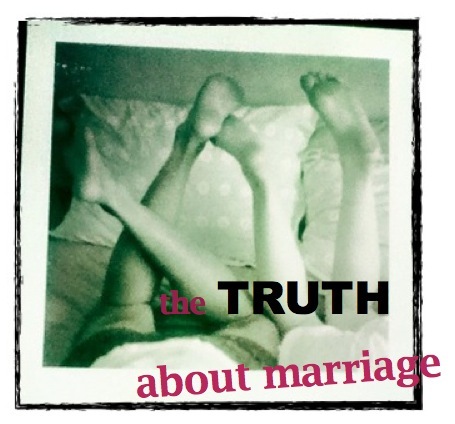 The truth about marriage. ← What does LOVE require of me? As a single girl in the city, I need this. Thank you. Our ordinary is how lame our evenings can look sometimes. We usually eat together, but after that we do our own thing. Neither of us have physical touch as a love language, so we’ll sit in different rooms on our computers while we work. Sure, there are a few nights a week that we watch a tv show together or cuddle a little on the couch, but it’s more common we do our own thing. I can relate to your thoughts on marriage In the first year of marriage and when we started our family it sounded a lot like what you describe. We had to make time for dates so we could have meaningful discussions. I think marriage moves through cycles and is very dynamic. The first year was a lot like you described trying to figure out who does what, how do we fit in each other’s every day schedule, in general how do we do life together. After the first year we began to make more and more time for each other and had a lot of fun. I almost didn’t want kids because I couldn’t imagine life being any better. Then we agreed to have children and we had to learn to do life again together all over but this time trying to fit the baby and then baby and toddler into our everyday life. We had our trials but we conquered them together. Around this time we really began seeking and calling on the Lord together and learned to pray aloud together, for each other. We were growing as a family and in our faith and knowledge of our Saviour. I don’t know how families do it when they don’t have Jesus as their foundation. The next stage was busy with activities for our children and we loved it even when it was a bit tiring. Seeing life through fresh eyes. Now my oldest is an Adult already living his own life and my youngest is 15. My husband and I are finding we have more and more dinners just the two of us because of their busy social lives and we are adjusting to this next stage of our marriage. This stage is still very busy with jobs, housework, home maintenance, homeschool and ministry and we have to work hard at finding time to share with each other how are day went but I imagine soon life will slow down enough that maybe we will have even more time for more meaningful discussions. I would advise making time to go on dates with each other weekly, pray together for each other each morning, hug and kiss each other before parting and follow what the Bible says about marriage. P.S. Marriage should be a place where you feel, safe, accepted and secure. We had times when our behavior wasn’t the best toward each other but we always apologized and forgave. It is not easy to humble your self when you do wrong, or to forgive when you’ve been hurt by the one you love most but it is what God asks of us. God has used our marriage to make us who He wants us to be in Him. I have learned to react with much more grace then I had in the beginning and so has my husband. God is still using our marriage to mold us into what he can use here on earth and preparing us for what he has for us in eternal life. I love this and will definitely be sharing it on Twitter. Thanks! I don’t know what any of you are talking about. My marriage looks like the rowboat scene from The Notebook all the time 🙂 JUST KIDDING! Thanks Brett. I’ll be sure to check those out! –“i love our little routines because they’re ours” well said. Anna, maybe that’s what makes the ordinary so worth it, right? When I watch my married friends drive away,it is specifically the normal mundane togetherness that I am wistful bout, not the magical journey through a bed of roses.